Hope no one minds that I revived an old post. These 24 ouncers are now being sold. I've seen a few other people on various social media, saying they found them for $1.50 each at Dollar General Store. So I'm curious, is this just test marketing? Has anyone else seen them for sale yet? The Dollar General Stores near me do not have them. I haven't seen them yet, but haven't been in a dollar store for awhile.... will have to stop by & check it out soon. As a side note - Dew Labs is also taking a survey about new 16oz cans for $.99 -- so hopefully that will be something we will see at some point. Here is a picture of the 4 we were asked to "give our opinion" on. Nice picture! I still don't like the whole "mtn" branding though. I just logged into Dew Labs to give my opinion and it did say they will be released. "Check out the new 16 Oz. designs! First you voted on the 24 oz. can design, then you chose the poster. Now, check out these 16 oz. cans based on the design you voted for! They’ll be hitting shelves later this year - let us know what you think!" I still have not heard whether these are "test" of if they will be available everywhere at some point. I found some in a Dollar General Store in the volunteer state. The cans are in a cardboard display hanging on the end of an aisle. The hanging display had 4 or 5 shelves, each containing four regular and four diet cans. Also on the display, it said "Exclusively in DGS". I wish I had taken a picture of the store display, but I was more concerned with how I was going to get so many cans up to the register! Here's a shot of the cans (with a 12oz can beside them for size reference). macoan - thanks for the new 16 oz designs preview. I found a couple of stores that had the 2009 16 ouncers in the cooler, so I would imagine they will be getting the new ones when the come out. In the 4 Dollar General stores in my area, it said the 24oz cans were available in only 2 of them. So I checked one out today, and they had 2 of the regular dew cans there - YEA! So I was at least able to get 2 of those - now I just need to find a couple of diet 24oz cans also. I did end up finding the Diet Dew cans also - Tough cans.... bent my "church key" bottle opener trying to open the bottom of the can.... a bit thicker then normal cans. I found Regular Dew, Diet Dew and Code Red at a Hess gas station 2/$3 (they were up front in a rolling cooler)... the Regular Dew has a silver tab on it. 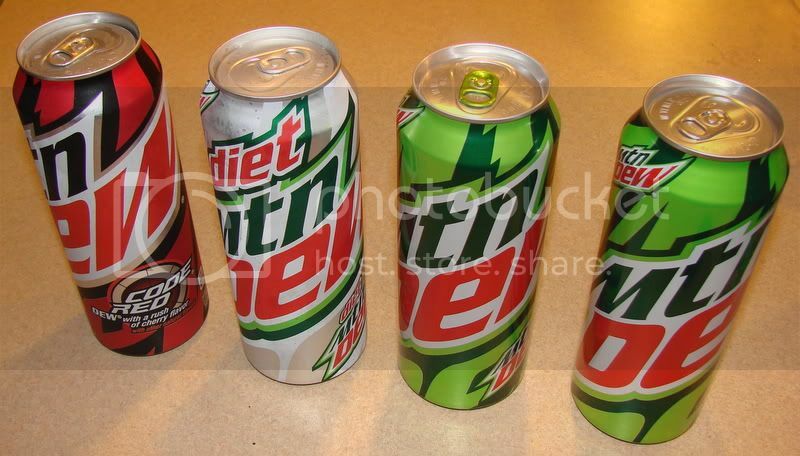 Then we found them at Walmart for $1.25, but the Regular Dew has a green tab on it. I don't know if the different color tab really makes a difference or not.... We (my son is actually the one collecting them) are pretty new at this. Welcome to the forum! Haven't seen the giant Code Red in my travels yet. Holding out hope though. 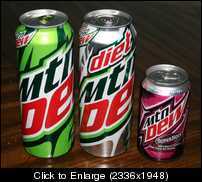 I was at the gas station today, and along with the above 24oz dew, diet dew, and code red dew - they had a 24oz Pepsi can. I'll try to get a picture posted soon.